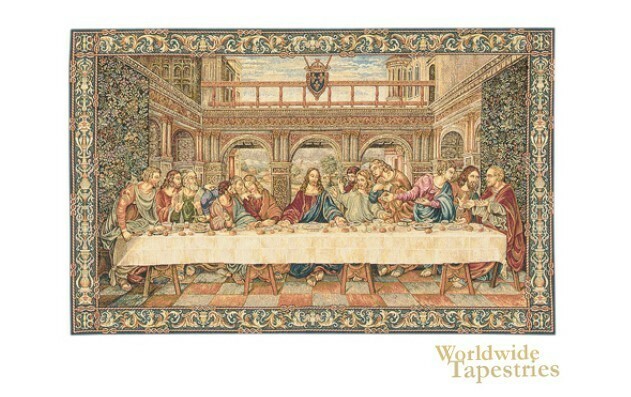 This tapestry depicts the Last Supper scene of Christ in detail. Woven in France, this work features detail and intricacy in this scene that is one of the most well known of da Vinci's. This scene shows the reactions of each of the twelve disciples when Christ reveals his betrayal. Christ is at the centre in a pyramidal shape, one of the three symbols of the Trinity in this piece. The other symbols of the trinity are the three arched windows in the room and the groupings of the disciples into threes. The ornate border complements the details in the main piece very nicely. This scene, with religious drama, Renaissance beauty and rich symbolism as well as masterful composition makes this piece a true Renaissance masterpiece. This tapestry is backed with a lining and has a tunnel for easy hanging. Dimensions: W 24" x H 17"
Dimensions: W 42" x H 24"